Published Dec 5, 2012 by Addison-Wesley Professional. Part of the LiveLessons series. What is Joomla? This lesson defines a content management system and provides an overview of Joomla! Joomla! Extensions Explained shows viewers how to install MAMP on your Mac OS, install WAMP on Windows, manually install at a Webhost, and do one-click installations at a Webhost. Joomla! Sites Explained demonstrates how to Navigate the public and administrator sides, create a new article, and change a template. Joomla! Content Explained presents the CASh workflow (categorize, add and show) and provides demonstrations of adding a new article and creating a new category using the CASh workflow. Joomla! Content Editing Explained demonstrates how to format text, insert images, add internal and external links, set publishing and article options, configure the edit screen, modify images and links, and add metadata. Joomla! Menus Explained shows how to manage menus, set up list and blog layouts and add new menus. Joomla! Components Explained demonstrates how to create banners, add contact information, send private messages to administrators, set up RSS feeds, use the redirect manager, use the search component, and create weblinks to external sites. Joomla! Modules Explained provides an overview of modules and how to create, re-order modules, change where the modules appear, and change when the modules appear. Joomla! Plugins Explained provides an overview of plugins and shows how to enable authentication plugins, use content plugins, configure editor plugins, select search plugins, configure user plugins. It also covers other plugins types such as extensions plugins and system plugins. Joomla! Templates Explained provides an overview of templates and demonstrates how to change templates and change templates and styles on different pages. Joomla! Extensions Explained shows how to find extensions and install modules, plugins, components, and templates. The video also demonstrates how to find commercially available templates. Joomla! Personal Site Example demonstrates how to install a personal site manually. Viewers will learn how create a CASh workflow and install components, modules, plugins and templates. Joomla! Business Site Example shows how to install a business site manually. Viewers will learn how to create a CASh workflow and install components, modules, plugins and templates. Joomla! User Group Management Explained shows how to set permissions for what users can see and what users can do and how to create Access Control Lists (ACL). Joomla! Languages Explained provides and overview of languages and demonstrates how to install the language manager, manage language categories, create language menus, set up the module language switcher and utilize language options such as site name, template name, and the news module. Joomla! Maintenance Explained shows how to update a Joomla site, uninstall extensions, manage site security with extensions, and use the global configuration setting. 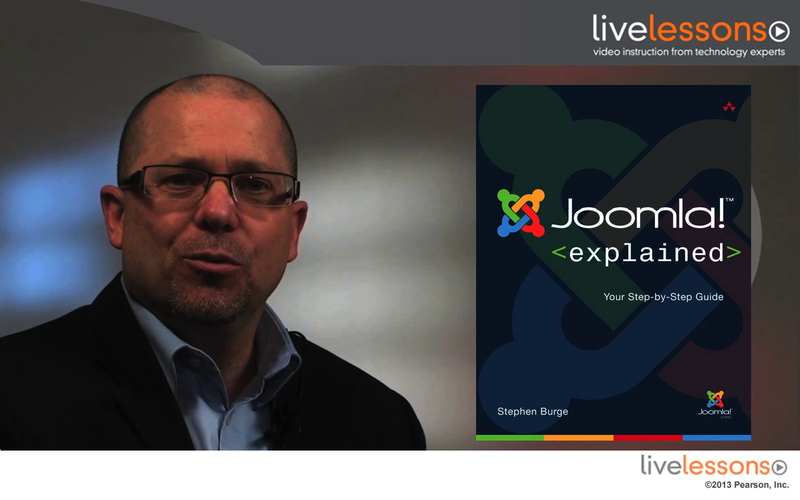 Rod Martin and Stephen Burge have taught thousands of beginners--and thousands more who’ve experimented with Joomla! but haven’t mastered it yet. Nobody knows more about guiding Joomla! users up the learning curve--from confusion to results.